Berkeley 24"x36" & 30"x42" Drafting Tables - GS Direct, Inc.
Berkeley Classic is the original professional folding table for Art and Drafting, but often used by crafters and students. The Berkeley Classic is the original fold-away table for art and drafting but can be utilized for multiple applications. 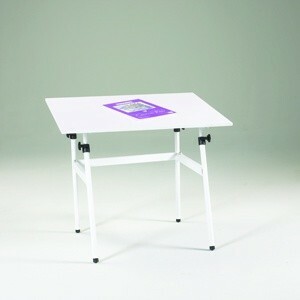 The base is constructed of enamel-coated, heavy gauge steel and has a larger footprint than other tables in its class. The Berkeley Classic adjusts from 32"-53" in the flat position with a 0-40° tilt range. Sturdy like no other available and built for a lifetime.